Is the world safe, is Europe in trouble, is Europe on the brink of collapse? These are probably the questions everybody asks right now or has been pondering about for a while. I saw a clip of a local newspaper where a fellow Berliner in his 70s stated that he is so upset because security measurements on Munich Christmas markets are so much better than the ones in Berlin. This guy obviously never travels, or at least he hasn’t been to Munich’s Christmas markets recently. I visited many of them this year and also a few in Berlin, there is no difference in security whatsoever, at least for the untrained eye, I mean I’m no double agent, no idea what goes on behind the scenes. It is all pretty much the same. I wonder where people take these statements from. Who puts these ideas in their heads? Why do they spread information about things they haven’t even experienced themselves? I have to admit, chances are that guy is in the know because he is a double agent. Travelling is so exciting. The people, the food, the passion, the fun. Nothing is ever only black and white. It pays off to talk to locals and try to understand their point of view, try to understand their way of life, and with understanding them comes empathy. This year I visited South Africa, the Czech Republic, Greece, France, Croatia, Slovenia, Italy, Austria, the Netherlands, Hungary, UK and Denmark. I will tell you about experiences I had this year on my travels. Wherever I go I ask people about the situation in their country, how they feel about it, and about their opinion about populism and the rise of right wing parties. I do things like this a lot and people usually don't mind to have a chat. Follow me around, to learn where I felt threatened and unsafe. In January I read a headline in the Sun By Nick Parker, Chief Foreign Correspondent in Berlin: “Berlin is so swamped by migrants the city is in ruins.” I’m almost missing for words; one look out of the window, and I can happily confirm that, sorry Sir, Berlin isn’t in ruins. The word “swamped” alone is misleading; we are talking about humans and not about a natural disaster, and to use the word “ruins”…. Heavens. I go for hour-long walks through Berlin, and no, everything is still standing, no one and nothing is ruined. And there aren't refugees swimming the streets of Berlin. The only thing that really is in ruins still, is Berlin airport (and no one can confirm it ever to be opened). In South Africa, a country I visit frequently, I’m always amazed about how far this country has come. It is a magnificent place really. On the odd occasion I feel ashamed and shocked about how some people treat black people. It tells me that the world has a long way to go still till we are all getting treated equal. I don’t feel threatened nor unsafe in South Africa. In Munich, on several occasions throughout the year, I join a demonstration against a radical xenophobic group. In the centre of town I have to listen to most terrifying things like "all of our women will get raped by a Muslim, ..." It is sickening, they spread hate wherever they can. Another guy states “ I travelled to a few countries in my life, and now I’m back here in Germany, at home, and I want this to be my country, and for my countrymen only.” He again is implying that there are too many foreigners living in Germany, he doesn’t give any numbers, and who is he to decide who is allowed to live where. A lady from that xenophobic group imitates another lady who had a question and speaks German with a French accent. Petty minded. The positive thing is that there is only a small group of these right wing people in front of a larger group of demonstrators. The other demonstrators and I can’t believe to say things like these are allowed, immigrants I speak to about this are scared. A lady at a boutique tells me she hopes that these racist organisations will be a thing of the past soon; she doesn’t want to give them any chance to get bigger, and will speak out against them till the end of her days. In March in Athens I had so many amazing conversations with people from all walks of life. Many Greeks are obviously very upset about the austerity measurements, and many I spoke to can see why they are in this mess. People tell me they have no idea how to get on with their lives; there are initiatives where neighbours help each other out with food and clothing. Restaurants and cafes are packed with people, service is swift, warm, welcoming, and one can pay with credit card. Many tell me how saddening it is that so many believe Greeks are lazy or not willing to work. One chef tells me that Athens is the new Berlin. I don’t feel threatened, neither by Greeks, nor by refugees. I ask myself once more where all this panic comes from. I spent days walking through Prague on the hunt for third wave coffee, and I also visit a concert. People on the streets and in the audience seem relaxed, everybody sings along and dances, and there is no reason to believe that people fear each other. The town is busy; locals and tourists go about their business, take photos, go to work, smile, laugh, love and eat. I don’t feel threatened in Prague. I spend most of April visiting several German towns. 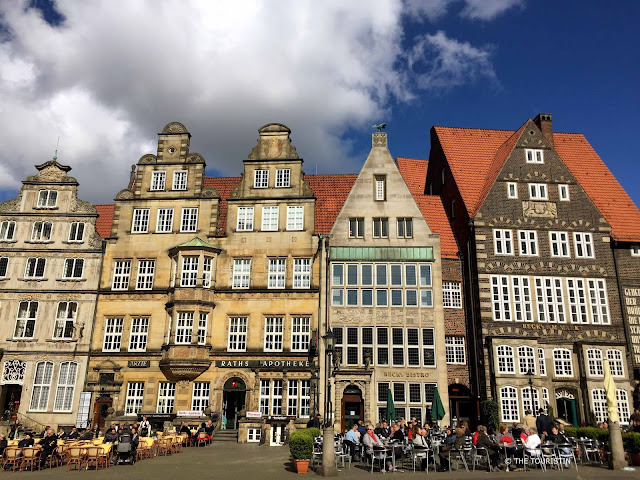 Next to trips to Bremen, Hamburg and Muenster I also visit several small country towns. I travel on in my mission to ask people what they think of xenophobia, and whether they see that there is a reason for it. All are pretty open minded, and are convinced to give populists no platform and space whatsoever. Germany looks and feels pretty much as it always had, safe and sound. I don’t feel threatened. I make my way to Strasbourg in May, I simply have to see the European quarter, the place where people believe and fight every day for a great future. Streets, restaurants, stores and museums were packed with happy locals and travellers, there was a great atmosphere. I had no reason to feel scared of anything; people were welcoming and fun to talk to. I don’t feel threatened in Strasbourg. In May I also went to Split in Croatia and had the most interesting time, people were full of life, there is this interesting restaurant scene, and cafes were brimming with people, fantastic atmosphere really. I knew that at the time Croatia had a cultural minister who believes the WW2 Croatian pro-Nazi militia to be martyrs. The way I experienced people didn’t really go together with these nationalist believes, that dream of somehow isolating their people. At first I didn’t want to visit, since I feared Croatians would all be nationalist and unwelcoming, I’m glad I went; it was so very lovely that I visited again in June. I don’t feel threatened in Split. I eventually make it to Mostar in Bosnia-Herzegovina, I always wanted to visit. The Street Art is amazing and the history of the place most interesting, the present still complicated. The Muslims call one side of the river home. I don’t feel threatened in Mostar. I make my way to Rovinj in Croatia for some fun in the sun and to eat delicious food. After my trip to Croatia I visit Ljubljana, the capital city of Slovenia, which I experienced as a modern town that does everything to show Europe they are part of it. This year they are the European Green Capital. This is a place where you can see how new members of the EU embrace programs to make the world a better place. I reckon with what happened over previous years and during the Yugoslav wars people might be slightly scared of foreigners stealing their culture. One lady told me not to worry; she feels Slovenia is on the right track. I don’t feel threatened in Croatia, nor in Slovenia. In Munich I go to demonstrations against right wing populists, we face a small group speaking out against foreigners "flooding" our country. Honestly, I am more and more convinced that they don't know that there is a whole beautiful world out there. You can’t talk to them, they repeat the same nonsense over and over again, and they did so probably until they believed in it. In July I visit Verona, I have to see Juliet’s balcony (or at least what they tell us is Juliet’s balcony). In general Italians are open minded, welcoming, fun to talk to, and pro Europe. To me the perfect thing with Italy is that Italians are so very much in love with their cooking and the whole lifestyle around it, it is natural to them. They obviously don’t fear that someone is going to take anything away from them, and they don’t fear that somebody is going to smash their culture or whatever else it is right wing populists are trying to sell Europeans. I think Italy is a very ordered place; they drink their coffee at a certain time, they eat food in particular regions and so on. It all seems very traditionalist, but they are very humble; they don’t force their ideals on others. Italians just invite you to discover all their foodie traditions for yourself and to fall in love with it. I don’t feel threatened in Verona, nor at Lake Iseo visiting to see Christo’s Floating Piers, nor in Castelrotto hiking in the Dolomites. Rhodos is a holiday place in the sun; I speak to countless locals about austerity measures and the future they see for themselves, they believe it will work out in the end. I get to know an US citizen who holds some position for the government, he says that Trump will never be elected; he tells me there is no reason whatsoever to worry about this situation. Some English women I talk to at a restaurant, they sit at a table nearby, apologise for Brexit, they are terrified of the future. I’m full of hope, as long as we talk to each other, it is good news right? I don’t feel threatened in Greece. I drive to the Czech Republic again, this time to Cesky Krumlov and Tabor. I again speak to people, everything seems relaxed, I have a long talk to the owner of a combined Restaurant and Design Store, and he tells me that he doesn’t understand this panic anymore. Czechs should actually be so very proud; their quality of life improved tremendously after the iron curtain fell, but many lack the energy to take matters in their own hand, they are still too used to a government looking after them, and too many fall for the populist news, that refugees “swamp” the Czech Republic. He says these numbers are in fact unneglectable, only 1,150 people applied for asylum. It is summer, the news packed with stories that want to scare people, and after everything I’ve seen so far this year, I actually can’t see a reason for it at all. I don’t feel threatened in the Czech Republic. In Munich I go and check out the anti-foreigner group again, the about ten people and they had to change their location, but they are still forecasting doomsday scenarios. It is frustrating, how can they be so ignorant and short sighted. Some people obviously do everything to be in the limelight for a few moments (and be it only in the pedestrianized zone of Munich). I don’t feel threatened in Germany. Later in September I travel again to Slovenia and this time I make my way to Maribor and Ptuj, and Lake Bled, there I hear that some fear the far right-wing populists are doing a great job at hiding their intensions, they sell their ideas as patriotism. Hard to believe, why do people buy this nonsense? I feel happy here, there is no threat at all, and nobody and nothing whatsoever I need to be protected from. In late September I visit Innsbruck in Austria and I can’t believe my eyes when I see a poster from the far right wing party that states “power needs control,” oh wow, what do these sick people want to tell us? I don’t feel any threat in Innsbruck nor when I go hiking in the Alps, I have no idea what the far right party is talking about when they want to protect Austria, protect from whom? Soon after I visit the candidate of the Green Party gets voted in, again, in the rerun of the Federal Presidential Election. The Austrians rejected the far right wing guy. I don’t feel threatened in Austria. Later, I make my way to Lago di Braies, it is magical. I don't feel threatened. In October I visit Budapest, it seems that apart from tourists, there are no other foreigners on Budapest’s streets at all. I have no idea whom they fear and why (in the first place) to be honest. What a sad situation. So very strange, they are in central Europe but oppose multicultural societies out of fear that their culture dies out. I have a magnificent time, walking the streets, taking photos, drinking coffee, going out for dinner. I can't put a finger on it, it moves me deeply, there seems to be a certain inhibition all over town. I don’t feel threatened in Hungary. Amsterdam is always a good idea; you can only have a good time here. People are outgoing, welcoming and friendly. I also spent a few days on the coast in the sleepy seaside town of Egmond aan Zee, same here, lovely. All the while the anti-Islam, anti-EU right wing politician tries to convince the Dutch that their country is a dictatorship since he wasn’t allowed to say that The Netherlands has a “mega Moroccan problem.” It is a bit sickening how would Moroccans feel to be called a problem? That guy obviously lives in a very different world, when was the last time he left his home? I don’t feel threatened in the Netherlands. I travel to Cologne, Bonn and Munich. All good here, I don’t feel threatened in Germany. London, I don’t feel threatened here. I have to admit it is hard not to wonder constantly who of these guys on these busy streets voted for Brexit, it is heartbreaking; the whole situation makes me so very sad. We will see what the future brings. I see how Munich prepares for Christmas, I don’t feel threatened here. This December in Paris, on one afternoon, I went to Angelina on Rue de Rivoli for my hot chocolate fix, it was too busy so I got a take away hot chocolate. While I waited in line a member of staff approached me and asked whether I would like to buy something else, and I bought a delicious and pretty box of chocolates. I bluntly asked her to please not vote for Le Pen, and to believe in Europe and peace. She replied "I would never vote for this f*** Le Pen, the one who plays with fear. I'm scared of her and her plans." It terrifies me too, and I answered "Look around you, we live in the most beautiful place." She smiled with a somewhat sad look on her face "I know and we have to fight for it." I didn’t feel threatened in Paris, no idea why populists reckon France needs stronger border protection. I spent Christmas in Denmark, in Jutland. Amazing landscape, perfect scenery, we even have a proper storm one night, which is pretty much the only dangerous incident throughout my stay. I don’t feel threatened in Denmark; it is a rather peaceful place. As we reach the end of 2016 I come to the following conclusion. Living in peace is like avocado on sourdough drizzled with olive oil together with a green smoothie plus a flat white for breakfast, followed by strawberries sprinkled with coarse black pepper. It is totally delicious. I understand that not everybody loves travelling as much as I do, and that not everybody feels the need to travel as much as I do, but please talk to people who travel, talk to strangers, but talk, try to find the truth and see the reality. One thing is for sure; after I visited all these places I can assure you there is not a single reason to be worried. Please don’t fall for the ones who promise you to rescue you from harm; generally speaking there is actually no one out there who wants to harm you (we all know there will always be criminals, but that is a different matter). This is the truth and nothing else. See our right to travel, and to trade with different nationalities as a chance and not as a threat, just allow yourself to see how amazing your life is. I always enjoy your insightful perspective on travel, Dorothee. It really can help bring positive change to the world! Great article. It's refreshing to read sanity in the midst of all the populist fearmongering.